HVAC Wayne| Plumbing Services NJ | Air Conditioning 07470 - Even Flow Inc.
MAKING YOU SO COMFORTABLE, YOU MAY NEVER WANT TO LEAVE HOME AGAIN! From your simple home repairs and toilet replacements, to extensive remodeling and renovations, we are the facilitators of satisfaction. Guaranteed by Jeff the owner, 30+ years in the industry. We are a small company for a reason…. 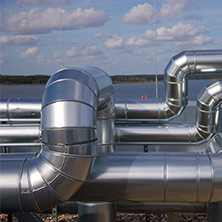 Heating systems can be intimidating, complex, and misunderstood sources of your stress. Our goal is to provide you with amazing service and eliminate the stress by creating a comfortable and energy-efficient home for you. Let’s keep it simple and stress free…For all of your heating needs, from A-Z, call us to get an estimate that’s free. Need service, sales, alteration, or installation? We service the major manufacturers, keeping you cool while economizing and reducing your carbon footprint. From basic air conditioning components to sophisticated high efficiency systems, we can help keep you comfortable. Your concerns are ours so feel free to call when you need to. We will be happy to advise you about scheduling to take care of your issue. We won’t lie to you and tell you we never sleep. We are a small company and need to take naps too. We have a passion for what we do and we love working for customers in your area. For the past 25 years, we have gained thousands of satisfied and loyal customers, one customer at a time. Service is in our blood and we love helping others. Know that education is a never ending endeavor, we ensure that our staff engages in continuing education about code changes, new equipment, better service techniques, and so much more. Our main goal is to save the customer money while keeping them both safe and comfortable. 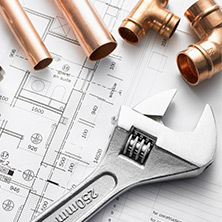 From small plumbing jobs to your central heating and air conditioning needs, we service, maintain, repair, replace, upgrade, improve, and design. We do it all, including full bathroom and kitchen renovations. If you are in need of our services and are working with another construction company, we can seamlessly interface with them to get the job done. Just give us a call. For more information about all of our services, click below. For the past 25 years we have been operating primarily by word-of-mouth. Our success was earned one client at a time. Although you may not have heard about us just yet, we understand that that’s just because we’re a well-kept secret. Rest assured we are fully trained on all of the most popular brands and manufacturers in the area. We have tons of experience, resulting in thousands of satisfied customers in your area. 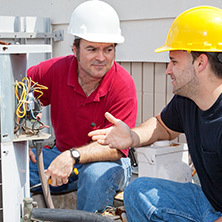 We are fully bonded, insured, and licensed for Plumbing, Heating, and Air Conditioning and guarantee our work. We are professionals and will always treat you with respect. Our goal is to have a business relationship with our clients for many, many years. We guarantee to you that we will not use high pressure sales or scare tactics. That’s not the way to do business and certainly not the way to keep clients happy for years to come. Feel free to explore our services further or request one of our free quotes. Just click below.